Softcover • 8" × 10"
The Hexopedia is a one-of-a-kind story of magic words — what they’re made of, where they came from, where they can take you, and how they interact with the world and with each other. It is a whimsical training manual on speaking, writing, and listening magically. It is a treasure chest of hands-on techniques to access the full wisdom and power for beginning things, attracting things, protecting things, and bestowing things. It reveals how to assemble, paint, and manipulate words, even invisible words. It teaches how to become fluent in the language, or rather languages, of spellcraft, and how to interact on a magical level with the elements, the animals, and the trees. It is meant to enlighten its young readers and inspire them to create pure wonder and awe whenever they speak. Sources range from the hierophants of ancient Egypt; to the high priests, medicine men, sorcerers, and alchemists of the Middle Ages; to the necromancers and wizards of legend and fairy tale; to the workers of wonders and miracles throughout history. The Hexopedia showcases those powerful words and spells that give shape and form to ungraspable feats. The Hexopedia was inspired by the fact that the shop windows of Universal Studios’ Wizarding World of Harry Potter (Los Angeles and Orlando) display genuine-looking tomes of magic but don’t offer them for sale. 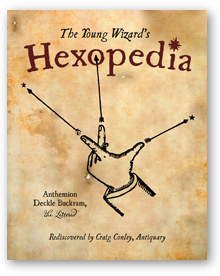 The Hexopedia looks, feels, and reads like an authentic artifact of wizardry, appealing to young fans of Harry Potter, Oz, Lord of the Rings, and other sword-and-sorcery books, films, and video games. Magic words are naturally as old as conjuring itself, echoes of the rhythm and vibration of creative power. A great many of these words have stood the test of time, passed on from master to apprentice, generation through generation. These ancient, musical, poetic incantations have a profound — but not necessarily unfathomable — mystique. For example, there is profound meaning in the clichéd image of a magician pulling a rabbit out of an empty hat with the word abracadabra. The magician is speaking an ancient Hebrew phrase that means “I will create with words.” He is making something out of nothing, echoing that famous line from Genesis: “Let there be light, and there was light,” only in this case the light is a white rabbit and perhaps a flash of fire. The magic word, whether it be abracadabra or another of the magician’s choosing, resonates with us because there is an instinctive understanding that words are powerful, creative forces. Unlike with so many magic books on the market, parents need not fear any nefarious intent or ideological subtext; The Hexopedia promotes a deliberately positive, universal message about empowering one’s communication skills for beneficial results. This is not an indoctrination into any system of belief or religious practice; rather, the book encourages readers’ imaginations as it slyly teaches ways to choose words carefully. The book offers text and diagrams that seem mysterious and occult yet are constructive and purposively devoid of religious overtones of any kind. The Hexopedia is expressly designed to foster treasured youthful experiences, inspiring a love of literacy and learning as it promotes intellectual growth through enchantment and entertainment.